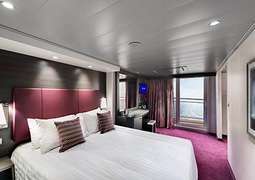 The variety of staterooms onboard the MSC Grandiosa is extensive, and includes great options for families, with staterooms capable of accommodating up to 10 people in comfort. 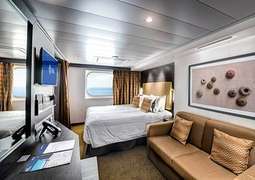 The "Yacht Club" suites are extravagant and chock-full of amenities, while balcony, ocean-view and interior cabins are elegantly designed with all the features you'll need. Solo travelers are looked after too, with interior studio cabins. 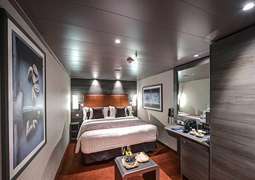 Most cabin types give guests the option of choosing between the "Bella," "Fantastica" and "Aurea" Experiences, which provide different perks and advantages ranging from priority boarding and access to certain areas, to drinks packages and ideally located staterooms. There are 12 dining venue options on the Grandiosa, ranging from specialty restaurants to the buffet, where fresh, authentic food is served each day. Guests enjoy performances by the world-renowned artistic entertainment providers - Cirque du Soleil. Sing and dance the night away in the karaoke bar or the Attic Club, have a laugh at the comedy club or chill out in the TV Studio & Bar in the evening, after you've splashed around in the super-amusement park or worked out in the sports center. Both you and your kids will love the state-of-the-art F1 Simulator and bowling alley, while the Teens Club looks after them if they're too cool to hang out with their parents! The Baby, Mini and Juniors Clubs promote a fun and nurturing atmosphere for younger children. The Sportplex is a great, spacious arena for kicking a ball or playing games, while of course as you'd expect, a well kitted-out gym is also present, equipped with state-of-the-art Technogym equipment, with the opportunity to take part in fitness classes and training programs. MSC Aurea Spa is a Balinese-inspired luxurious setting offering signature relaxation treatments to leave you feeling refreshed and invigorated. Features include a thermal area, nail boutique and beauty salon. The social hub of the vessel known as the "Galleria" is a Mediterannean-style promenade. With boutiques, bars and restaurants, passengers could stay here all day and be entertained. Along with the fantastic stores here that offer fine jewelry, clothes and souvenirs, evenings in the promenade prompt entertainment including music, parties and even flash mobs.